APTRO is an US registered Brand. building up more charismatic men with our brief design and top-leveled quality. We strive to strictly control the quality, so that you will receive satisfied goods . We picky to every detail, becuase we are responsible and sincere for each customer . Elastic strap belts, Casual style. FABRIC-- professional Bi-stretch fabric for board shorts, super soft smooth and cool feeling, quick dry, sun protection. no matter you are swimming, walking or at home, APTRO trunk will flex with your every move and make your wearing experience more comfortable throughout the summer. DESIGN-fashionable classic elements for the mens swimwear, Low-key luxury and bright colore swimming shorts for men perfect for casual and holiday. TAILORING-- three-dimensional cut, relax fit mens swimsuits, smooth calm, neat car line technology to ensure comfortable effect of the swimming trunks. 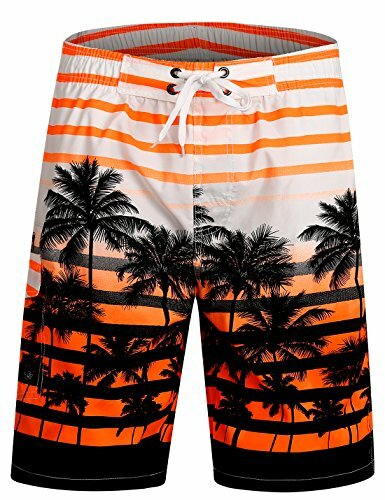 FEATURES-swim shorts featuring elasticized waistband with drawstring, it could fit you better, two side pockets can be expanded to hold your water bottle or small accessories, one back pocket with Velcro, only orange style with mesh lining others no lining.